Enhance your productivity by turning your Windows based USB-C laptop into a full-scale workstation. This dual-monitor USB-C dock lets you easily connect two monitors (1x HDMI and 1x DisplayPort) using one USB-C cable, with no setup of display drivers required, right out of the box. 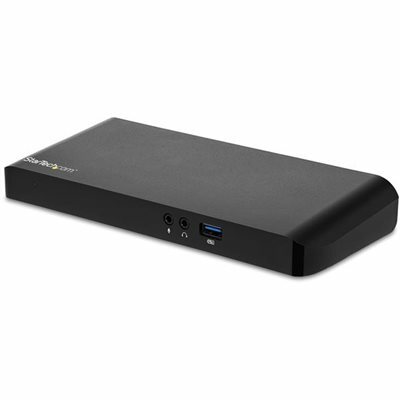 The USB-C dock provides 60W charging power, and four USB 3.0 ports to connect devices. With easy dual-monitor setup, the dock is ideal for wide-scale use in office workstations.This USB-C dock lets you connect dual monitors with flexible options, and with no display driver setup.Connect your USB-C laptop to dual displays: 1x DisplayPort and 1x HDMI (cable included) at 1920 x 1200 resolution @ 60Hz.You can also connect to a single 4K HDMI or DisplayPort display. The included 3.3 ft. (1 m) long USB-C cable makes it easy to position your laptop and improves the video signal quality.Unlike some USB-C docks that may drop to USB 2.0 and limit Ethernet performance, this USB Type-C dock offers full USB 3.0 and network bandwidth. This provides faster data transfer speeds when using your USB 3.0 peripherals and supports true Gigabit Ethernet network throughput.USB Type-C dock gives you plenty of ports with four USB 3.0 ports, a reliable Gigabit Ethernet port and easy connection to the microphone and headset ports. Connect flash drives, keyboard, mouse or external hard drives using the three Type-A ports (including one Fast-Charge port). Connect a USB-C device with the USB-C port.The USB C docking station with Power Delivery will power and charge (up to 60W) your laptop, while powering your devices.Ensure your laptop's drivers, firmware, and operating system are current prior to using the docking station. Video output capabilities depend on the video card and hardware specifications of the connected laptop. Not all USB-C ports support the full functionality of the USB Type-C standard. Ensure that your laptop USB-C port supports DP Alt Mode and USB Power Delivery. Not all Thunderbolt 3 USB-C ports support the full functionality of the Thunderbolt 3 standard. Ensure that your laptop Thunderbolt 3 port supports USB Power Delivery.